The Universe is a magnetic field of positive and negative charges, constantly vibrating and producing electro-magnetic waves. Each of these has a different wavelength and speed of vibration; together they form the electro-magnetic sphere. 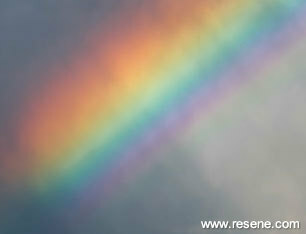 White light when seen through a prism or water vapour splits into the colours of the spectrum. Of all the electro-magnetic sphere it alone can be seen. Radio waves, infra-red waves, ultra-violet waves, x-rays and gamma waves can not be seen. There is a cycle of changing colours that affects us through the different stages of life. These are reflected in our changing colour preferences. Children have colour likes and dislikes according to individual character and stage of development. Over a hundred years ago the pioneering educationalist Rudolph Steiner believed that people were surrounded by particular colours that had a spiritual influence and objective effect on their emotional life as well as benefiting physical health and mental well-being. Followers of the Steiner philosophy introduced his principles into their networks of schools and communities. It was believed that surrounding children with soft pastels and rounded architectural forms at the kindergarten level (2-7 years), progressing to central shared learning areas with stronger more vibrant colours for older children (7-10 years) then onto larger shared work areas in which soft greens and blues were used for children from 10 into their teenage years, was less distracting to the mental concentration of each stage of development. Strong, bright colours have the effect of shocking the baby’s inner vibrations, which can make the baby unsettled and restless. Bright, intense colours such as primary red, yellow and orange can stop a child from sleeping well and cause them to cry. Bold patterns and strong contrasting colours are also likely to be over-stimulating in large doses, so for a small infant soft tones of yellows or creams, peaches or pinks, which radiate warmth and peace are emotionally soothing and comforting. Though soft blues and pinks have traditionally been used for baby rooms, creamy yellows, peachy apricots and minty greens are also excellent colours for both genders. Green is calming but can be cold when used as a wall colour, especially in a south facing or dark room. Yellow or blue-based greens create differing effects. Blue-based greens are good as a cooling element in a hot north/west facing room. The fresher yellow-based greens are beneficial when used as an accent in soft orange or red rooms. This will add a balance to colours that are warming and stimulating. Blues on their own can also be cold, but can be used as a wall colour with contrasting warm colours in drapes, mats or bed linen. Clear pastels to mid-tones of blue are less cold and more appealing. Very dark blues are not recommended for young children as their intensity relates to DARK and can cause nightmares. Comfort colours for very young children are pinks, peaches, pale almond beiges and lavenders as these equate to love and security. It is advisable to stay away from bold geometric patterns on walls or drapes as they are generally distracting. Various shades of blue-greens work as study/learning colours and coupled with yellow-creams and lesser amounts of orange-yellows create stimulation energy. These types of yellow colours aid mental processes, helping logical and clear thinking without being too disturbing. It must be noted that ALL yellows no matter how pale are always much brighter than at first realised and many of them are acidic or green/sour, which can cause headaches and irritability, therefore yellows must be selected with care. Soft fruity coral reds and violet blues are good for social areas as they create inspiration and imaginative play. Reds are generally not as good for the implementation of ideas into concrete goals as they stimulate but don’t encourage achievement. Violets open both sides of the brain – both the logical and the creative – and children often do their most interesting work when small amounts of this colour are present. Like adults, children have distinct personalities and colours that appeal to their souls. This means that some children who are active and outgoing are happy in a brightly coloured rumpus/playroom. It may not however be what they need in a learning environment. Scaling down the bright hues they ask for to softer versions might be a wise thing. Work or study areas should ideally be decorated in more muted colours. Less energetic or more sensitive children might always be attracted to softer, paler colours but may need cleaner, sharper colours in a learning environment to activate them. Grey is not recommended as it is a hue with no direction or purpose. It is neutral and indecisive. White as a standalone colours in a learning environment is chilly and needs to be used as an accent to contrast with pastels or bright colours. Asserting individuality and growth spurts, both physically and emotionally, are typical of this time. Teenagers go through an identity crisis and often use black to hide this as they feel it is cool. Black needs to be combined with other colours if it is to be used as it is not beneficial to emotional development. It is without light. Using small amounts of fluoro brights will lift the young person away from the feeling of isolation or withdrawal from the world. Red is a favourite bright for this age group – intense energy. 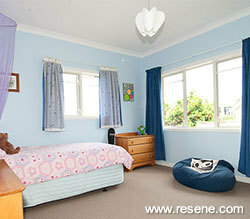 Bold blues and citrus greens also provide some tranquillity. Purple is usually embraced when the mind develops social awareness and outward thoughts – this is later in the teenage years, usually between 14-17 years old. Texture and changing sheens in fabric (matt velvets to silky satins) offer a positive tactile experience to teenagers as well as being seen to be desirable from a cool point of view. At this age a fixation with metal and glass in all forms is prevalent – car fetishes with young boys and jewellery with girls. Becoming old can bring about a sense of loneliness and fear so decorating with the elderly in mind needs to address warmth, security and harmony. Variety in the colours in the immediate environment can boost interest in the world and keep cognitive function alive. Older people can be drawn to soft pastels but they may not have the vitality of hue needed to stimulate the mind and mood. Eyesight problems can also impair how the colour is seen and what is seen. Softer shades of reds and oranges are warming and can help with circulation and energy levels. Peaches, apricots, warm tans, terracottas and pinks can also be used for this purpose. Reflecting on the past and thoughts of a spiritual future can also be reflected in colour choices. Soft blues, lavender mauves and violets are colours that connect to the spiritual or reflective mood. It is interesting to note that blue rinsed hair tints and lavender water are the province of the elderly lady. Studies carried out in nursing/rest homes indicate that soft pinky-beiges contrasted with soft blue/greens are soothing and peaceful. The judicious use of floral pattern can evoke the tranquillity of rural life and the simplicity of times past. In its natural form it is daylight. Helps the mind to be open, clear and receptive. Not good if feeling isolated or cut off. Dark and severe reds tend to have the ability to over-stimulate and agitate. Brighter oranges are very social and gregarious. Deeper oranges like terracottas are very warming. Falls between yellows and oranges. Less irritating to the nervous system than yellow. Bright sharp yellows are very tiring and can trigger migraines and travel sickness. Soft yellows used with bright blues are good for mental stimulation and growth in children. Those greens often referred to as Kelly Green are found to energise. Used with clear blues and pure white this type of green encourages physical activity. Works well in areas where you need to concentrate for long periods. Think of the ‘green room’ used by an actor prior to a performance. Cooling and helps encourage rest. Useful where fear is stopping activity. Mix of violet and red. Nurturing, promotes intuition, meditative and insightful. As a mid tone colour it has been used to denote cool rational thinking. Too much of this colour is demotivating. Earthy blend of orange, ochre yellow and black. Can make a space feel secure and stable. Black equates to lack of light – night – and is used to rest mind and body. Information collated by Carolyn Atkinson, Resene Colour Consultant, 2004. This article is provided for interest and is not intended as medical advice. For diagnosis and treatment of medical conditions always see your medical professional.